If Bryce Harper is doing it, then it has gotta be cool, right? The Washington Nationals slugger and NL leader in home runs decided to get his geek on during Saturday afternoon's matchup against the Los Angeles Dodgers. If you're the opposing pitcher, prepare to have the intimidation dial turned all the way up. 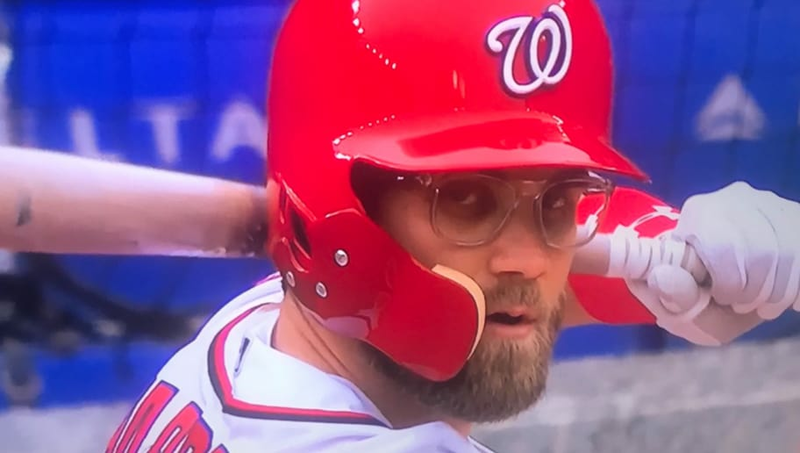 As a guy who wears thick-framed glasses daily and thinks four eyes are better than two, I have to give Harper the credit here. Is he at Eric Gagne-level ferocity with the eyewear, yet? No. There are still ways to go before hitting that elite status. A couple of blasts here and long bombs there, however, and we may just see the league's best hitters start to adopt the new trend themselves. Keep your contacts in their respective cases boys. Ray-Ban and Dolce & Gabbana just found its new poster boy!